Turner’s work was often inspired by the Anglo-French conflicts of the Napoleonic period. The Battle of Trafalgar is depicted in his work from 1806 (Tate Gallery), and in 1822, he was commissioned by King George IV to produce a new painting on the subject (National Maritime Museum, Greenwich). The ships that participated in the battle, such as HMS Victory and The Fighting ‘Temeraire’, Tugged to her Last Berth to be Broken Up, which followed in 1838, are presented as heroes in the paintings. Patriotic sentiment and a political current also underpin some of his most famous historical paintings, including Snow Storm: Hannibal and his Army Crossing the Alps (Tate Gallery, exhibited 1812) and Dido Building Carthage; or the Rise of the Carthaginian Empire (National Gallery, exhibited 1815), both of which equate Carthage with Britain and its triumph over the French Empire. Finally, during the 1840s, it was Napoleon himself who took centre-stage in Turner’s work, in the enigmatically titled painting, War. The Exile and the Rock Limpet. The work was originally intended as a companion piece for another canvas, Peace – Burial at Sea (Tate Gallery), which commemorates the death of Turner’s friend and member of the Royal Academy, Sir David Wilkie, aboard the Oriental during his return from Constantinople. 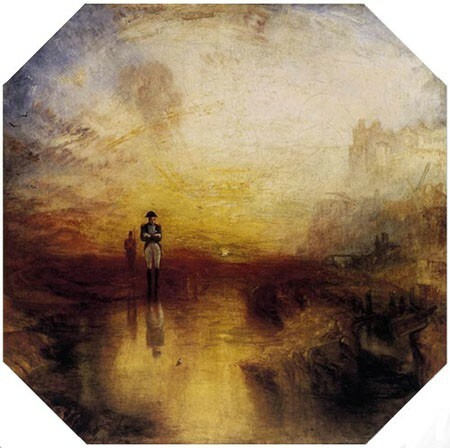 In order to fully understand Turner’s intentions behind the two paintings, they should be placed in the context of the Retour des Cendres in 1840. Wilkie’s sombre burial at sea is juxtaposed with the triumphal return of the deceased emperor following his long period of captivity on the island of St. Helena and his unhappy end. The singularity of the composition is striking. The ghostly figure of Napoleon – a British sentry in the background reminds us of his captivity – studies thoughtfully a tiny mollusc, a rock limpet also known as a barnacle. This ridiculous and derisive confrontation emphasises the emperor’s utter despair during his exile. In contrast with the pale and solemn colours in Peace – Burial at Sea, Turner here uses a magnificent palette of warm reds and yellows as a metaphor for war and the “sea of blood” (Turner’s own words) that poured forth from the Napoleonic campaigns. The union of the sky and the sea, a popular theme in Turner’s work, allows him to explore in more detail the permeation of light through atmospheric conditions and to experiment with a formal, almost abstract approach in his depiction of a blazing rich sunset. Although greatly criticised for it when War… and Peace… were exhibited in 1842, this painting can be seen as a further step down the path towards the abstract, which would culminate in the artist’s famous 1844 work, Rain, Steam, and Speed.